eCite - Equipping parents to support their children’s aspiration: What works? Equipping parents to support their children’s aspiration: What works? 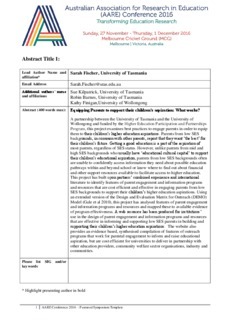 A partnership between the University of Tasmania and the University of Wollongong and funded by the Higher Education Participation and Partnerships Program, this project examines best practices to engage parents in order to equip them to their children’s higher education aspirations. Parents from low SES backgrounds, in common with other parents, report that they want ‘the best’ for their children’s future. Getting a good education is a part of the aspiration of most parents, regardless of SES status. However, unlike parents from mid and high SES backgrounds who usually have ‘educational cultural capital’ to support their children’s educational aspiration, parents from low SES backgrounds often are unable to confidently access information they need about possible education pathways within and beyond school or know where to find out about financial and other support resources available to facilitate access to higher education. This project has built upon partners’ combined experience and international literature to identify features of parent engagement and information programs and resources that are cost efficient and effective in engaging parents from low SES backgrounds to support their children’s higher education aspirations. Using an extended version of the Design and Evaluation Matrix for Outreach (DEMO) Model (Gale et al 2010), this project has analysed features of parent engagement and information programs and resources and mapped these to available evidence of program effectiveness. A web resource has been produced for institutions’ use in the design of parent engagement and information programs and resources that are effective in informing and supporting low SES parents in building and supporting their children’s higher education aspirations. The website also provides an evidence based, synthesised compilation of features of outreach programs that work for parental engagement to inform and raise educational aspiration, but are cost efficient for universities to deliver in partnership with other education providers, community welfare sector organisations, industry and communities.